When struggling to think of the perfect gift for a loved one, the safe fallback is always something to fill their tum! While you may be a good egg and want to opt for a bag of satsumas with a bow on top, be a good sport and try out this easy peasy sweet treat recipe – a chocolate and cranberry slab. 1. Break up the dark chocolate and melt it in a bowl (preferably over a saucepan of boiling water, but you can do it in the microwave – just add a little lump of butter to stop it burning). Leave to cool for ten minutes. 2. 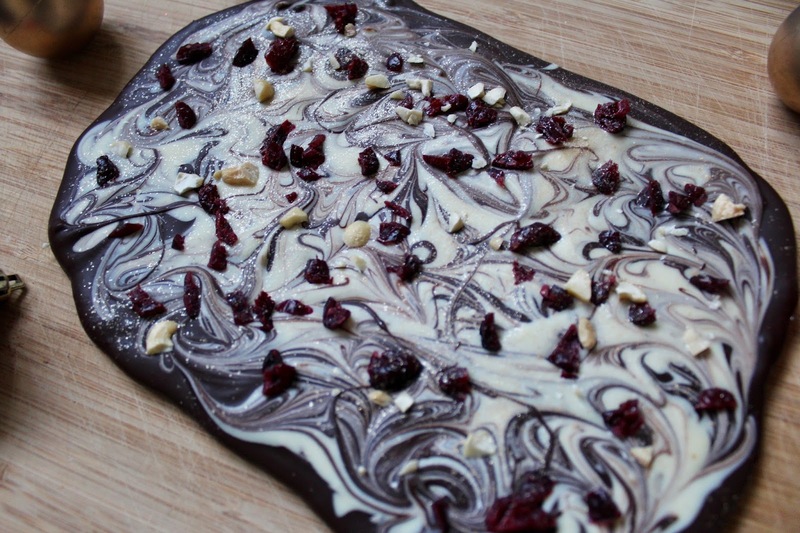 While the dark chocolate is cooling, melt the white chocolate and put to one side. 3. Finely chop your chosen toppings – I went for dried cranberries and a few cashews, but this would work with almost anything (within reason – not sausages, etc). 4. 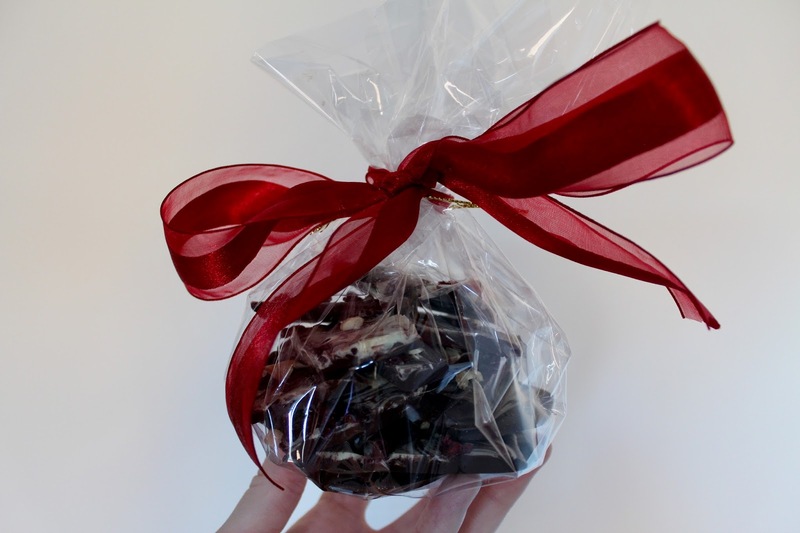 Line a tray with baking paper and pour the dark chocolate into an oval shape. 5. Slowly pour the white chocolate all over the dark. 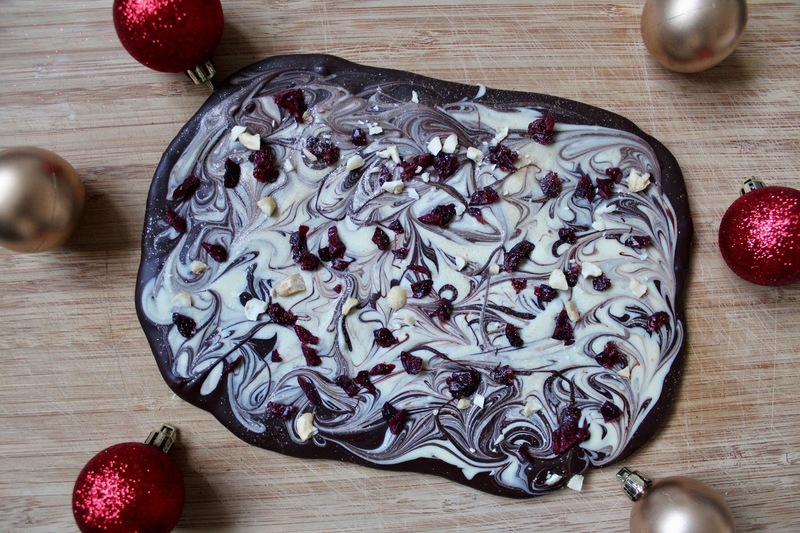 Grab your cocktail stick and lightly drags it over the surface of the chocolate to create a marbled effect. 6. Sprinkle your toppings on and pop in the freezer for an hour. Voila! Keep it in the fridge until you want to be a piggy. If you can resist temptation and fancy giving this a go for a present, all you need is a piece of card and some cellophane – I got 3 metres for £1 in Wilko’s Christmas section. 1. Cut a 12cm x 6cm rectangle of card. 2. 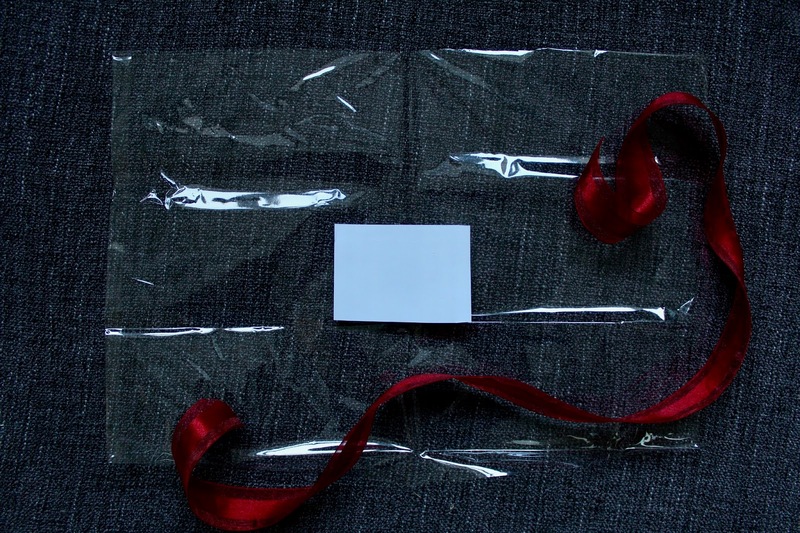 Cut a much larger rectangle of cellophane, around 40cm x 30cm. Glue the card on to the centre of the cellophane to act as your base. 3. Pile up your chocolate on the card – you’ll need to work quickly, as touching it too much will make it melt! 4. Pull the cellophane edges together (like tying up your hair) and secure with an elastic band just above the top of the chocolate pile. Add a ribbon for the icing on the cake/chocolate! Tweet me a photo @kirstiepicker if you give this a go!